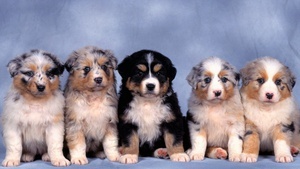 Photo showing the diversity of coat colors and patterns within the Australian Shepherd. As a laboratory that works directly with breeders and dog owners, Paw Print Genetics (PPG) is often asked to reassure the customer that our tests accurately determine whether a dog will get a disease. The customer is actually asking a couple of different questions; one involving the accuracy of the test itself and one regarding the clinical validity of the test. It is important to understand the questions being asked so that the answers make sense.